There was always something special about Sarah since birth. She was charismatic, she lite up a room with her presence. She was funny! She laughed at everything, in a contagious way. I miss that so much. Sarah was kind and always went out of her way to make you feel happy. She liked to take care of others, especially kids. Sarah loved children and hoped to one day be a teacher or have a big family. Sarah was diagnosed on April 27, 2016 with T-Cell Acute Lymphoblastic Leukemia (ALL) at the age of 14. "Your child has cancer", words you never want to hear as a parent. She was treated at Goryeb Children’s Hospital and The Valerie Center in Morristown, NJ. Sarah fought hard for 12 months. We enjoyed our “good days” every chance we could! 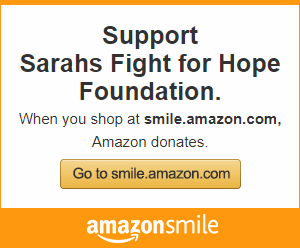 Sarah’s battle was not easy but what life-threatening disease is easily fought. She was valiant in her battle. Brave beyond reason. She wore a smile up to the end and put others first until her last breath. She is our HERO. Sarah gained her wings on April 18, 2017, at the age of 15, after relapsing with Acute Myeloid Leukemia (AML). This bright soul is now our inspiration to give back and help others. In her memory and to honor how she lived, we will take our grief and transform it into something positive for other pediatric cancer families. HOPE.